Baby Mama: I've created a MONSTER. I love to read. I love bookshelves. I love libraries. I love bookstores and the feeling of leaving with a fresh new stack of books to read. I love laying in bed every night with my current book. I love the feeling of having to finish a book. If I could somehow get paid to read, I would. 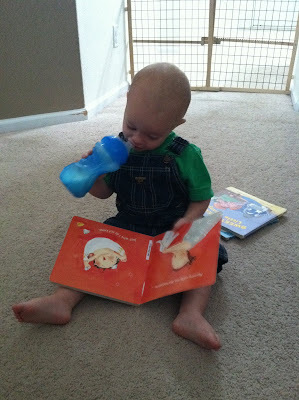 It is probably not surprising that I wanted to pass on this love of books to my son. I started taking him to story time at the library when he was 2 months old. We have read to him since he was a day old. He had a beautiful stage where he sat quietly on the floor and would "read" books to himself and flip through all the pages. But now we have reached a new milestone where Paul wants us to read aloud to him. Let me rephrase: Paul demands we read aloud to him. He will find a book from his basket, walk over to one of us, and throw the book in our laps, and make a whining sound that I am pretty sure translates to: READ THIS TO ME NOW LADY. We try to practice saying "please" and then he crawls into our lap for some story time. When the book is over, we exclaim "the end" and close the back cover. We are so stupid. Paul tosses that book right back into our hands and screams, "AGAIN!!" It is possible we read the same book over and over and over again for an hour. An hour people. While I can't be irritated by this little man's love for the written word, I'm wondering how I can just teach a 16 month old babe to read on his own. Ryan reminds me that this is all.my.fault. Let me just give a hallejuah.... all the teachers out there are down on their knees.. please DEAR GOD... put this child in my class. The written word, the spoken word, the literary word.. this child is receiving all of it... there isn't a better gift in the whole wide world.. He is one lucky baby !! This is the BEST problem to EVER have with your child!!!!! You will know this to be true in 15 years!!!!!! Trust me on this one!